One of our staff’s favorite sections is the recently purchased engagement rings page, which showcases a selection of engagement rings that have recently shipped out from our office to the customer. The photos come from our regularly updated Instagram account, which you should definitely follow if you like these pictures. 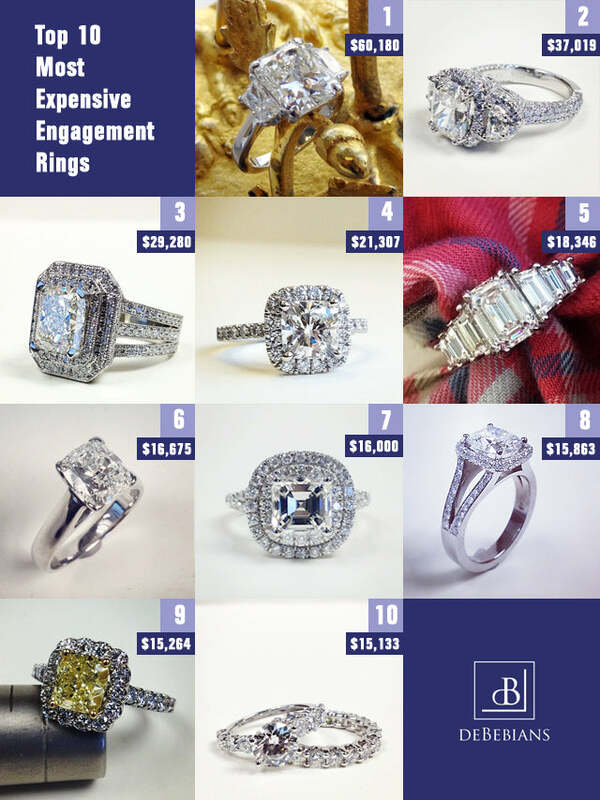 I thought it would be fun to curate a top 10 list showcasing the 10 most expensive engagement rings currently shown on our recently purchased page. Of course, these expensive engagement rings represent a snapshot of time of about one to two years and only rings that are lucky enough to make it to that page. Custom engagement rings are our specialty, so it’s no surprise to see that most of these designs were custom made for our clients. Some of them we liked so much we added them to our catalog, and they can now be ordered through our website. This classic three stone ring features a 4 ct. radiant cut diamond flanked by two trapezoids (0.79 cttw.) in a 14k white gold setting. It was originally a custom piece, and it’s now available in a smaller carat weight on our website as style # HE228. This unique three stone diamond ring features pave to the max with 1 cttw in pave set diamonds. The center 3 ct. cushion diamond is flanked by two half moons (0.60 cttw) in this intricate platinum setting. This was originally custom, but it’s now available as style # HE217. This double halo style is very popular, and many variations can be seen on our recently purchased page. This is certainly one of the prettiest with a 3 ct. radiant center diamond set in platinum, with a total carat weight of 5.33. This cushion cut halo engagement ring is another very popular style, and this particular version shows it with a square-shaped 2.15 ct. cushion diamond. For additional sparkle, the ring was customized with extra diamonds on the ring’s gallery. I’ve seen cheap replicas of Angelina Jolie’s ring on the Internet, and I think ours is much closer in design, much nicer, and very pretty. The story behind this ring can be found here: Get the Celebrity Look for Less: Angelina Jolie’s Engagement Ring. It’s now available on our website as style # HE239. The “expensive” part, like all these rings, really is in the diamond, like this 2 ct. cushion. The custom platinum solitaire setting cost only $675 at the time (it would be more expensive now). This particular style is not available on our website, but we do offer similar solitaire styles. This style of double halo is a relatively new addition to our collection and is an increasingly popular look. We can make it for any shape of diamond with a variety of shank and accent diamond options. Here it is with a 2 ct. asscher diamond in 14k white gold. This split shank engagement ring features a 2 ct. cushion diamond and 0.70 cttw pave set diamonds in 14k white gold. We also offer this design with a round halo. This custom halo engagement ring features accent round brilliant diamonds that are larger in size than most of our other halo engagement rings, giving it a scalloped look. The center diamond is a 1.60 ct. fancy intense cushion cut yellow diamond. This setting is now available on our website as style # HE210Y for a yellow diamond or style # HE210 for a white diamond. For this one, the cost provided is for the custom engagement ring only, which features a 1.50 ct. round brilliant diamond and six accent diamonds (0.60 cttw). (The matching eternity ring was about $3,150.) Round is by far the most expensive diamond shape, which is one reason why you’ll often see people opting for a non-round diamond shape in order to get more bang for their buck, especially when it comes to big, expensive engagement rings. This exact style is not on our website, but we offer some similar styles on this page or you can request a custom quote. Please leave a comment and let us know which ring you like the best!